I shop at a variety of venues: farmer’s markets, Whole Foods, and local chain grocery stores. During my shopping trips, I am constantly amazed at the prices in the prepared food section. Pasta salads and cooked vegetables boggle my mind. I realize that the stores are charging for the labor, but around $8 a pound for “grilled” vegetables? From the prepared food aisle, I can see the produce aisle where the same vegetables are $1.99 a pound!!! Zucchini and Squash are sometimes even less. It’s not like the prepared food aisle is selling organic, free range, pastured eggplants, right? Who’s on the grill? Bobby Flay?!?! And, is there really a grill in the grocery store? Or are we dealing with “grill pan” vegetables? So many questions, but honestly, I don’t care. For way less than the prepared food aisle grocery store would charge, grilled vegetables are seriously, no big. So, the next time you are contemplating buying these in the store, just stop. Don’t be that person. Seriously, it may take 10-15 minutes out of your life, but it will taste better and cost you much less. Our grill had been out of commission after what we affectionately call “fire #2”. The gas tubing had rusted through in a few minor spots and when combined with particularly fatty pork chops, well, let’s just say there’s a reason to keep the fire extinguisher close at hand while cooking. We cleaned everything up, got new tubing and recommissioned our amazing grill. During Spring, Summer and Fall, if it can be grilled, it will be grilled. Cooking is quick and clean up is relatively easy (assuming a fire free experience, of course!). The key to great grilling is to preheat the grill for a bit. I usually preheat for about 5-10 minutes at high, then turn down the heat to medium to cook. I know, I use propane. Gasp. The horror!! Not PROPANE!!! There is something very effortless about flipping a knob and instantly having heat. I just don’t have time during the week for charcoal. Do I think charcoal is better? Yes. But, I’m not cooking for the Michelin guide reviewers. I’m cooking for my husband and two kids. They can deal with propane. Grilling vegetables should be big enough to not fall through the grates. If you have smaller vegetables, you’ll need a wire grate type contraption. 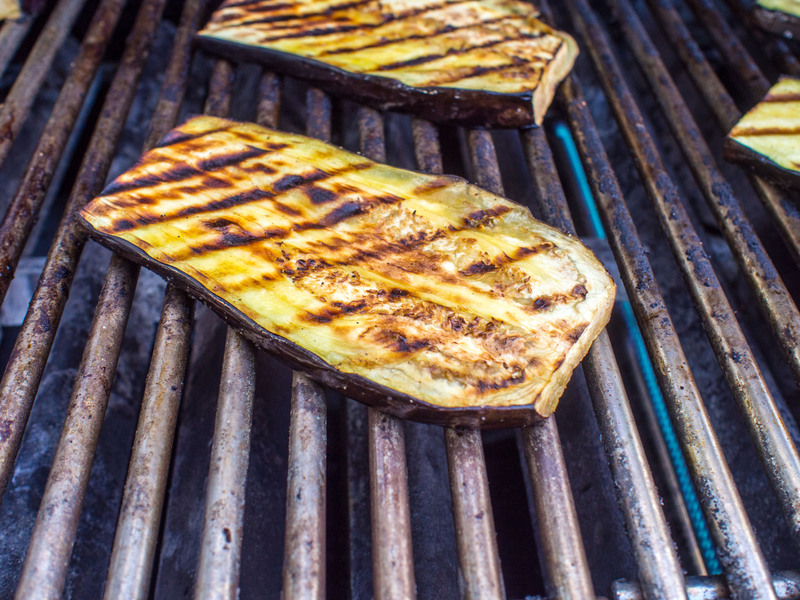 Eggplants, squash and peppers are rather perfect for the grill, but you have to cut them thick enough and wide enough to avoid fall through. I leave the skin on because it seems to keep everything in place pretty well. The skin also doesn’t really taste bad when grilled. You or your guests can remove the skin if they do not feel like eating it. Generously coat slices with olive oil on both sides. Salt and Pepper to Taste. Turn heat down slightly. 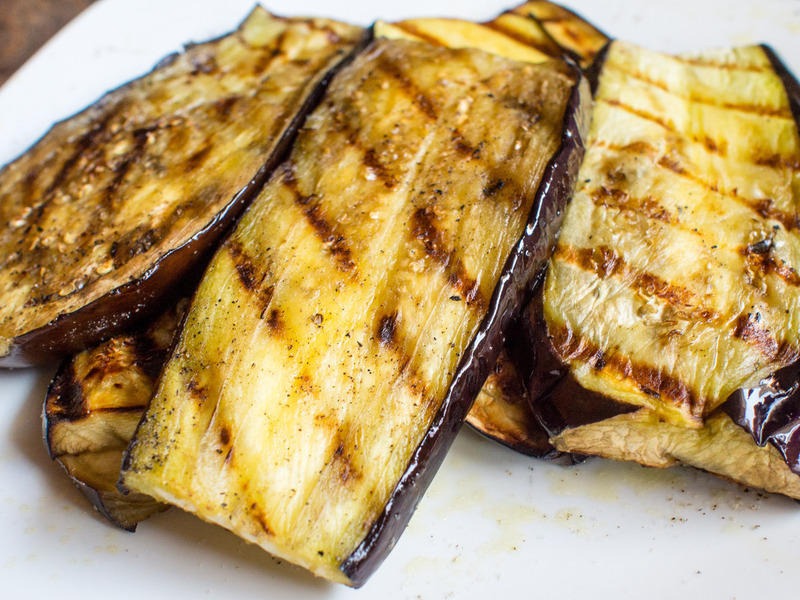 Place eggplant slices on grill for about 3 minutes. Check to make sure there is no burning. Flip vegetables over (I use tongs) for another 3-4 minutes, until the eggplant is cooked through with grill marks. Check occasionally to avoid burning. Remove from grill and serve. This entry was posted in Vegetable Side and tagged Gluten Free, Low Carb, Vegetable Side on April 16, 2015 by dawn of food.